The post An Inside Look Into the Life of a Police Dog by Wendy Newell appeared first on Dogster. Copying over entire articles infringes on copyright laws. You may not be aware of it, but all of these articles were assigned, contracted and paid for, so they aren’t considered public domain. However, we appreciate that you like the article and would love it if you continued sharing just the first paragraph of an article, then linking out to the rest of the piece on Dogster.com. Sargent and officer Wyrick. Photography courtesy Wendy Newell. I sat down with Sergeant Schlotterbeck and Sargent’s handler, Officer Mark Wyrick, to learn more about the work they and their dogs do. Wyrick, like all the K-9 handlers in the unit, spent time on the traditional police force before applying to the specialized K-9 team. Once chosen, he was paired with Sargent, and the two went through a 240-hour training course to make them a skilled team. Sargent, like all dogs currently on the Fontana force, is cross-trained in two specialties. His training includes suspect apprehension and narcotics/firearms detection. Wyrick and Sargent’s training didn’t end after that first extensive session; it is continuous. Most of the unit’s dogs work for six to seven years, starting between the ages of 18 months to 3 years old. Even Sargent, who is near retirement age, takes part in 10-hour practice sessions with the unit and individual training with Wyrick during their shift. Wyrick has a bite sleeve and other training tools in his patrol vehicle so he can meet up with another K-9 unit for some in-field practice. My visit was during one of their long days at their training facility, so I experienced Sargent’s talent firsthand. The Fontana K-9 Unit has strong community involvement. Its civilian-led support group, Fontana Police K9 Pals, raises funds to make sure the dogs and handlers have the equipment needed to do their jobs and keep them safe. This included the donation of a training facility that houses a number of practice structures and equipment. It was at this training facility that one of Wyrick’s fellow K-9 officers suited up in a full bite suit that allows Sargent to show off his apprehension skills. Each human member of the team takes turns in these suits playing the part of the suspect. “One of the most important things is having a decoy who has learned to understand the dog’s behavior. If you’re training them [apprehension dogs] you don’t want to train them the wrong way. Decoys are as important a piece of the puzzle as the handler is,” Schlotterbeck explains. The suit does an excellent job of keeping the faux criminal from getting hurt. In fact, analyzing a dog’s bite pressure is an important part of the job. You don’t want a pup who’s hesitant to take someone down, bites down with too little pressure or releases that pressure before being told to do so by his handler. When not working, Sargent can be found in his kennel in Wyrick’s patrol vehicle or at his home, which Sargent shares with Wyrick, his wife, two human siblings and two small dogs. Fontana police K-9 vehicles are equipped to keep the canine officers safe even during the triple digit temperatures that hit their area of California. Should the inside of the vehicle become too hot, the car’s fans turn on, windows roll down, and the horn goes off as does an alarm attached to the officer’s belt. At home, Sargent has a kennel outside and a crate inside, which he prefers and where he sleeps at night. The force has strict rules on what happens to the dogs when their handlers are not at home. Although Sargent gets along very well with everyone in the house, when Wyrick isn’t there Sargent is in his crate or kennel. When Sargent does retire, Wyrick will buy him back from the city, and the talented pooch will live out his life as a family pet — a very well-trained family pet! Q: What is Sargent’s diet? A: Sargent eats Canidae dog food and is fed 4 to 5 cups of food daily depending on our work schedule. Sargent gets dog treats as a reward (on occasion). Q: Does Sargent get any human food? Q: What type of gear does Sargent use? Q: Are there certain health issues that Sargent’s job causes him to have, and how do you address those? Q: Do you groom Sargent yourself or do you take him to someone to be groomed? A: I groom him myself with baths every month, and I inspect him daily to ensure no health issues arise. To learn more about police dogs, visit nationalpolicedogfoundation.org. 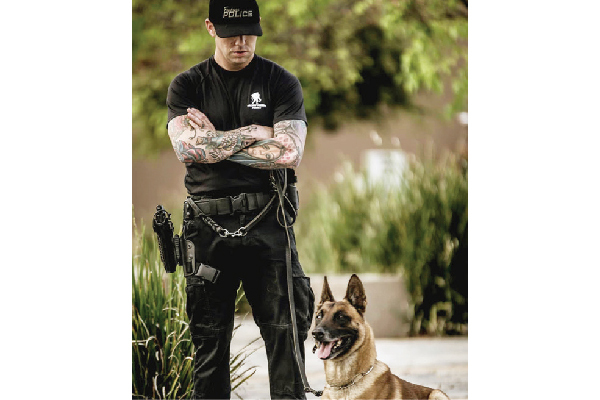 The National Police Dog Foundation promotes education and awareness, as well as raises funds for the purchase, training and veterinary care for active and retired police K-9s. Thumbnail: Photography courtesy Wendy Newell. Wendy Newell is a former VP of Sales turned dog sitter, which keeps her busy being a dog chauffeur, picking up poop and sacrificing her bed. Wendy and her dog, Riggins, take their always-changing pack of pups on adventures throughout the Los Angeles area. Learn more about them on Facebook @The Active Pack and on Instagram @wnewell.